Hotel Vishwanath is a classic deluxe hotel strategically located in the holy city, Haridwar. The value-for-money property is entrenched close to the Ganga river which is holds world-wide religious importance. Vishwanath hotel makes the religious trip of pilgrims a relaxing and memorable one. 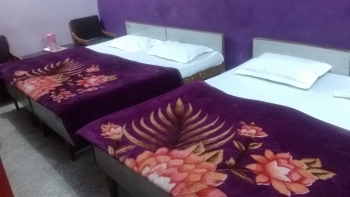 The hotel is located in proximity of Mansa Devi temple in Haridwar city. One can plan excursions to - Har ki Pauri (200 mtr), Mansa Devi (100 mtr), Bus stand (1.5 km), Chandi Devi (2.5 km), Railway Station (1.5 km), Bharat Mata Mandir (3 km), etc. The deluxe hotel maintains an array of 16 fully-furnished rooms beholding a mesmerizing view of river Ganga. 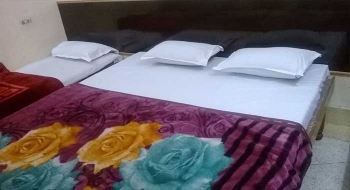 All rooms are stocked with an attached bathoom, TV, AC, 24/7 electricity, round the clock running water, room service, etc. The hotel owns a spacious well-lit grand restaurant which is decorated with vibrant colors, contemporary paintings, nicely managed table-chairs and a warm ambience to enjoy a romantic or stress busting evening. It serves its guests a wide variety of cuisines prepared by its expert chefs. Air Services are available only upto Jolly grant airport in Dehradun which is 32 kms from Haridwar. This is a major junction of Uttarakhand as all express trains passes from this railway station. Haridwar is well connected by trains to all the major cities of India. Hotel is located on the main highway, connected to all major center of the cities of the country by road. There are buses available from Delhi Kashmiri Gate to this place.